This privacy notice does not cover the links within these sites to other websites. We encourage you to read the privacy statements on the other websites you visit. UK Head Office: The Data Protection Officer(s), Solid Solutions Management Ltd, Building 500, Abbey Park, Stareton, Kenilworth, Warwickshire, CV8 2LY, UK. Our data protection officers can be contacted on +44 (0)1926 333777 or by email at privacy@solidsolutions.ie. to respond to a sales request or other inbound inquiry. to record, track and monitor technical support calls that you report to our support desk. to administer any training course, programme or event delegate bookings. to allocate training course credits and attendance. to keep you up to date with and invite you to any of our latest, relevant events, training programmes or webinars we are producing. to manage your online account and access to MySolidSolutions. We have a contractual obligation to manage and administer our customers’ subscriptions and purchases. It is in our legitimate interest to keep our customers and prospects informed of our latest content, products and services. In accordance with ICO guidance, we have undertaken a Legitimate Interest Assessment (LIA), for which further information and the LIA can be found below. We process customer and prospect data and use direct marketing as part of this legitimate interest. It’s necessary for us to use a variety of direct marketing channels and messages to ensure our contacts are kept informed and wherever possible, we make sure the messages we send are targeted and relevant. Any direct marketing we undertake complies with e-privacy rules on consent. The following LIA has been produced based on guidance set out in the Legitimate Interests section of the ICO website. We aim to promote and sell the products and services of SOLIDWORKS and Solid Solutions. A prospective or existing customer of Solid Solutions could benefit from SOLIDWORKS products and Solid Solutions services in one or more of the following ways, enable them to design better products, get their products to market faster, reduce material usage, improve manufacturing performance, etc. The consequence of these benefits could be one or more of the following, increased product performance, reduction in costs, increased profits, greater market share, etc. Many of our customers design products that have social, economic and charitable benefits. Any prospective customers who design and manufacture products within these sectors might therefore be able to deliver results that benefit the wider public. Our products and services help companies to become more competitive which in turn can stimulate competition (between companies) therefore driving down prices and improving product performance. This is difficult to quantify however The Big Life Fix (a BBC documentary, viewed at 2 minutes 10 seconds) shows how SOLIDWORKS can help designers and engineers to develop life-changing products! Organisations may not become aware of the afore-mentioned benefits. Yes, providing we are clear and transparent as to the intentions of the electronic communication and give the recipient a clear and accessible method for opting out of future communications. We could for example “cold call” the prospective customer however we believe this method is more intrusive than sending electronic communications. We could use traditional “non-electronic” forms of marketing such a magazine adverts however this is not always practical given the diverse range of industries that SOLIDWORKS covers. No – we do not ask for any special category data. Possibly, however disruption will be minimal and people will always have the opportunity to remove themselves from any future electronic communication. A loss of time with respect to receiving, opening and reading (and possibly unsubscribing from) the electronic communication. We do not knowingly collect or store Personal Data from children. We are committed to protecting the privacy of children and if we were to become aware that such information had been collected, we would treat that information as sensitive. 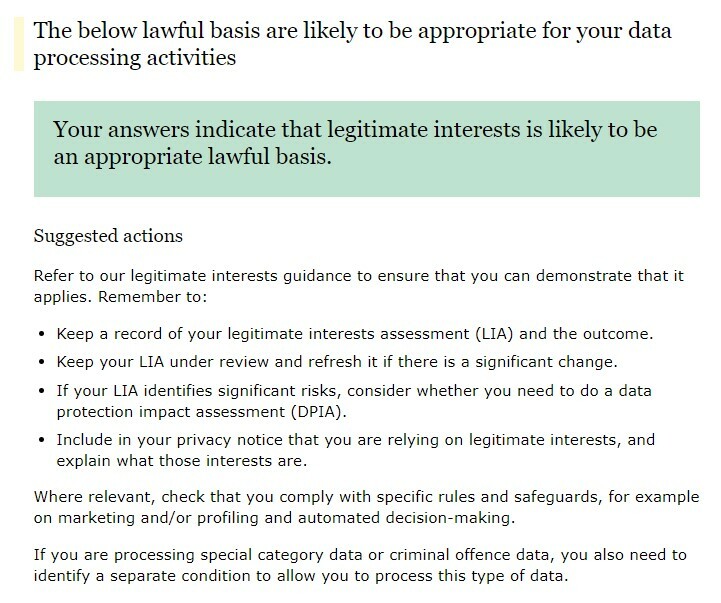 In addition to this LIA we have completed the Lawful basis interactive guidance tool on the ICO website. Webcast Wednesday & MySolidSolutions: Monthly emails to inform you of upcoming webcasts or specific content from MySolidSolutions that we think will benefit your organisation. Special Offers: From time to time we may send you promotional offers with regards to SOLIDWORKS products, services, training and hardware. SOLIDWORKS Upgrades: You will receive SOLIDWORKS Upgrade and Service Pack notifications inviting your company to update SOLIDWORKS to the next major version or service pack. Training Updates: We send quarterly training updates via email to inform you of local upcoming training events, availability and training offers. Product Information: Occasionally we may send you video links, white papers and information relating to new products and the use of SOLIDWORKS. Where possible we try to ensure relevance to your industry sector. Event Invites: Occasionally we may invite you to attend a regional Seminar, Free Training, Hand -on session or similar event. You can manage your preferences and unsubscribe from any or all of these different types of email at any time. •	Account Management: Occasional account management calls to check in on how you are getting on with any of our products or services you use. Telemarketing: Occasional calls about forthcoming training, content, offers or events. And for customers we’ll collect and store data on the transactions and purchases you make with us. We will keep your data safely and securely for as long as necessary or according to your instructions, and we review the data we hold at least once every two years. If you would like more information about how we store your data, please contact us directly. To find information relating to other browsers, visit the browser developer's website. To opt out of being tracked by Google Analytics across all websites, please visit http://tools.google.com/dlpage/gaoptout. Solid Solutions may receive data about organisations, industries, website visitors, marketing campaigns and other matters related to our business from our partners, affiliates or others, that we use to make our own information better or more useful. This data may be combined with other information we collect and might include aggregate level data, such as which IP addresses correspond to post codes or countries. It might also be more specific, for example how well an online marketing or email campaign performed. We may receive and store other information, for example if you participate in a live chat on our website, attend an event, apply for a job, request support, interact with our social media accounts or otherwise communicate with Solid Solutions. Any personal data we share with our content partners is shared only on the basis that the data will be used by the partner under a lawful basis of legitimate interest and according to the requirements of the GDPR. We specify this in contracts with all of our content partners. Solid Solutions may provide your personal information to a subsidiary of Solid Solutions, any affiliated companies or other trusted businesses or persons, acting under a confidentiality agreement, for the purpose of processing personal information on behalf of Solid Solutions. These parties are required to process such information based on instructions from Solid Solutions and in accordance with this Policy. They do not have any independent right to share this information. Solid Solutions may transfer Your Data if Solid Solutions is acquired by or merged with another company. Solid Solutions will provide notice before this occurs and will post a new Policy if necessary. Solid Solutions may share your personal information with a credit checking company or with a credit card processing company to bill users for Solid Solutions products or services. These third parties do not retain, share, or store any personally identifiable information except to provide these services and are bound by strict confidentiality agreements which limit their use of such information. You can request inaccurate or incomplete personal data held on you to be rectified or completed or for your personal data to be suppressed or erased, and we will respond within one month of your request at the latest. We will supply any data you request in a CSV file. You have the right to opt out of our direct marketing at any point, and we will deal with your request right away. You can unsubscribe from our emails automatically from our email preferences web page. To opt out of our direct mail or telephone marketing please call our privacy team on +44 (0)1926 333777 or email privacy@solidsolutions.ie. You have the right to raise a concern or lodge a complaint with the Information Commissioner’s Office (ICO). To protect data stored on Solid Solutions servers, we regularly audit our system for possible vulnerabilities and attacks. Whilst Solid Solutions will implement the security measures detailed above, transmission of information via the internet is not completely secure and therefore transmission via the internet is at your own risk.